Making Common Craft style videos with the kids is an old standby activity that we do in class. This post will not be an in depth look at making them, I kinda sorta wrote a post showing what we do each day a few years ago that you can read by clicking right here. If you are unfamiliar with Common Craft videos and wish to see student examples, starting there will help out. Please read the message from the founder of Common Craft videos at the bottom of the post and respect his wishes! Common Craft videos are excellent in helping your kids explain things. For this post I would like to go a bit into the set-up that we use which is what 99% of the questions that I get about these videos are concerning, and at the end of this post there are lots of comments from my kids with advice for you and your students. First we attach the camera to a tripod…if you don’t have one send an email home to students and staff, someone has one not being used sitting in a corner. After making our first Common Craft Style videos four or five years ago, I realized that resting cameras on books was not the best set-up. Since then I have acquired four tripods from people who were getting rid of them and fixed them up with wire and tape and they make life so much easier. The tripod with the yellow circle holds a cheap work light that you can find for $5-10. My room is dark and bad fluorescent lighting makes doing these video very difficult so we have to supplement. We have tried all sorts of colors for the background. It is very hard to take photos or video of white paper in my room and not have it come out gray (I’ll go more into that later). One group did go with a white background, but four went with black. I think in the future I might stick with black. It is easier to get crisp shots and the reality is no matter how many time you tell the kids to outline their images, some will still come up with simple pencil drawings and they can still be seen on black paper. The yellow circle is our camera. Pretty much any camera comes with a tripod mount in the bottom, and pretty much every digital camera comes with a movie setting. Even if you only have cellphones you can still film…picture of that coming up later. To get the best video you have to play with some camera settings. First, take your camera off automatic mode and set it to “P.” Then go into your menu and find the “white balance.” Set it for whatever type of lights you have. If you have white paper it should look as “white” as possible, if you have black it should look black. If you have a higher grade camera there will be a Kelvin setting in the white balance menu that would allow you to micromanage your white balance. Second thing you want to mess with is to set your camera to manual focus. I usually place one of the kids’ objects onto the “stage” while the camera is on the automatic setting, press the shutter button half-way to get the camera to focus, release and then set the camera to manual focus. Here is why…depending on the type of camera you are shooting with, when the kids hands come in to place objects down their hand is closer to the camera than the object they are putting down, so the camera might constantly focus and re-focus. Sometimes that results in a blurry image momentarily at each change of objects. Last but not least, almost every camera has a metering mode, the choice of where the camera should place most of its attention when focusing. Set it to focus on as many points as possible, not center spot weighted. And actually that should have been first, not last! Also don’t forget to set your video setting to the highest quality. Set your camera to video, hit menu, and it is probably under something like “record quality.” And as a bonus hint, stop deleting images from your SD card with your computer or camera..it’s bad. Get all your images off onto your computer, put the SD card back into your camera, hit menu, go to the settings that are under the wrench looking icon, find format, and erase everything by re-formatting the card with your camera each time you use it. If you are not sure how to do anything I mention, just google it! Something like — how to set white balance on Panisonic DMC-LX5 — is all you would have to do to get directions. Once you have everything set, you can zoom in a bit, or move the camera farther or closer to the stage in order to have it fit perfectly in the video. You do not need a fancy set-up, if you simply have a cell phone or any camera with no equipment all you need to do is to stabilize the camera, don’t try to have someone hold it steady. 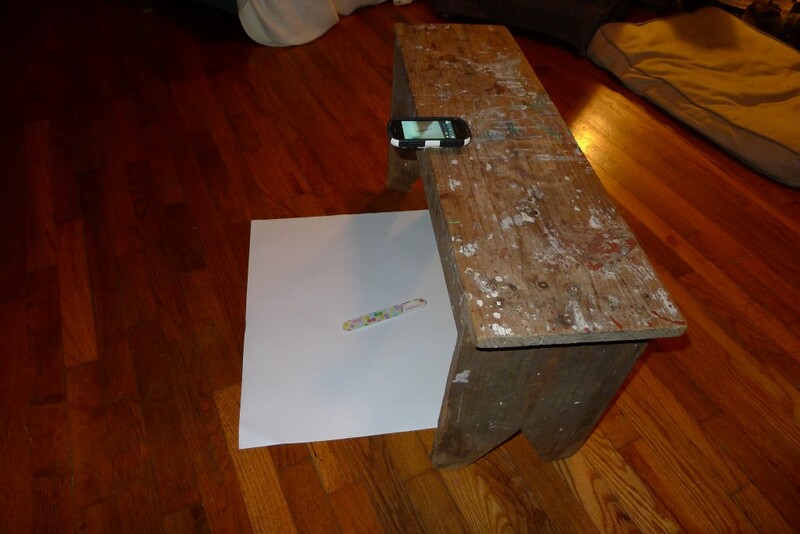 Even something this simple would be just fine if you do not have access to a tripod. The bottom two kids are the narrators, the top two move the images in and out. They have to place everything in upside down and on the opposite side on the paper that they want the image to appear in the video–think about trying to read in a mirror. When they do it for real, they stand in the same location. It is key that the narrator gets up as close as possible to the camera unless you are going to provide a wired microphone. In the picture below you can see a basic set-up that most kids used. This group had one person in charge of only removing objects–a good choice for four member groups. 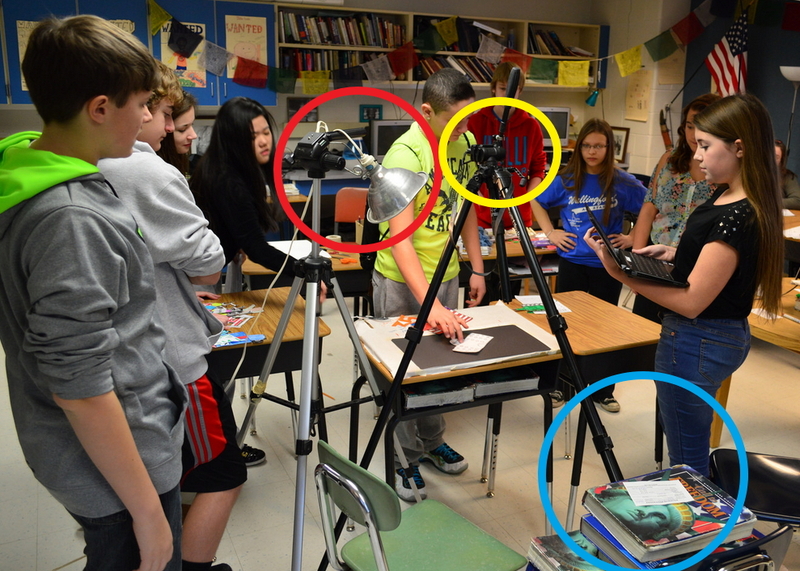 Some groups brought up extra desks to help them organize their items. The group below brought up two. The desk on the left was brought in with all their items organized in the order they were to be placed on the stage. They transferred them to the “stage” desk when the narrator was reading, and then brushed them off to the desk on the right. We filmed the videos last Thursday, came in and watched them Friday. When we were done the kids recorded some advice for teachers and students who wish to try making Common Craft style videos…I gave them all of 5 seconds to prepare for this! Just click on any image below a question and a video will play. «What does happy look like? »Should I sell my soul for rock n’ roll? Thanks so much for posting this info Paul. We are always excited to see students and teachers inspired by our work. I love the videos reviews by the students too. Nice work! I love Common Craft videos…what a great idea! I really appreciate the detailed directions and videos, it is evident that students have to rehearse quite a bit to get it ready for the camera. I’ve been playing around with Vine and Instagram video the past few days to figure out how I could use them in class. I feel like a modified version of this activity might be cool to use with those apps to make quick animations without dialogue, perhaps more akin to a paperslide video I suppose. The limited scope of the recording, and the fact that it wouldn’t be shot “live” might make it more approachable in terms of logistics. I guess it would just come down to amount of time available to devote to the activity. Have you done any student projects using Vine or Instgram video? I know exactly who I am going to show your comment to on Monday. A kid asked me today if I was going to start a vine account, I said “you do it.” I will take your chance comment as a second vote to get one started 🙂 We’ll see where it goes! Super! I’d love to see what they come up with. One of my teachers asked me how to add the time lapse effect seen in the Zombies in Plain English. Could you please email me any suggestions? I thought maybe the video could be uploaded into the Movie Maker editor and then transition effects could be added, but I’m not very sure. I suppose I could test it out, but if you have the answer, will you email me?